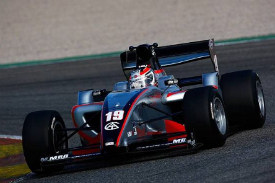 Nicola de Marco clinched his maiden pole position of the Formula 2 season in Saturday morning's qualifying session at Valencia. The 20-year-old Italian has started from the front row in each of the last two rounds at Brno and Oschersleben, and won race one in the Czech Republic, but sealed pole for the first time today. De Marco's best effort, a 1m26.348s, was nearly four tenths of a second quicker than anyone else. Though his car stopped just one corner after setting that time and had to be recovered to the pits on the back of a truck after the session, so the Italian didn't know he had pole until he got back to the pits. "I put new tyres on to make two fast laps and after the second, out of the first corner I put the throttle on and the car just stopped - fuel pressure I think," de Marco explained. "I knew that my lap was quick but I didn't know it was pole position." Benjamin Lariche continued his strong form from Friday's strong practice and will line up alongside de Marco on the front row for this afternoon's race. Valencia is a favourite track of the Frenchman, having taken his only international single-seater victory here in Formula Renault in 2008, and his front row start is only his second time qualifying inside the top six all season. Armaan Ebrahim and Will Bratt will line up on row two, with Bratt heading the challengers in the race for third place in the championship. Sergei Afanasiev and Philipp Eng are also in the fight for third and will start fifth and sixth. Championship challenger Jolyon Palmer is seventh, but could still keep his title hopes alive with points leader Dean Stoneman qualifying just 11th. Benjamin Bailly, Ivan Samarin and Kazim Vasiliauskas lie between them. Ramon Pineiro will start his first Formula 2 race from 13th, just ahead of Jack Clarke who slipped down the order after setting the qualifying pace before the switch to new tyres.